On page 123 of the book I Read it in the Local Rag is the story of the song Three Score and Ten. Some of the words are given on page 124. Disasters were of course reported in the newspapers. Often songs would be written about disasters to raise funds to support those who had been affected by the event. The great storm of 1889 caused much loss of life all along the east coast - as the song says, from Yarmouth down to Scarborough. (The seaman of East Anglia always talk of 'down' for north and 'up' for south). Here's a chance to hear the author of the book play the song for you. 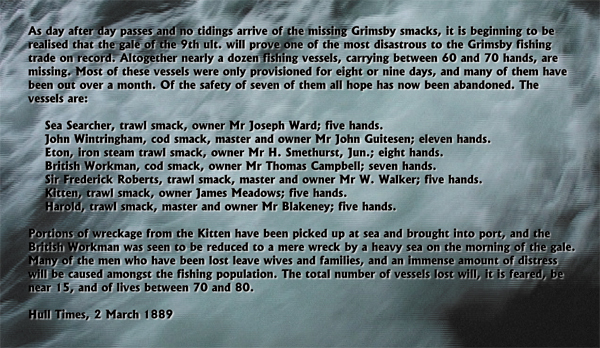 The song is attributed to Grimsby fisherman William Delf. These sort of songs were called 'Broadside ballads' and a copy of the original is in Grimsby library. Delf was himself lost at sea in 1893, aged about 40. Over the years the song has been passed down from singer to singer - and has changed a bit along the way. Bear that in mind as you try these questions. 1. What is a 'score' and so what number does 'three score and ten' represent? 2. Can you use the Internet to find where in the Bible the words 'three score and ten' are used and where in the plays of Shakespeare they are used? 3. Use the information on page 124 to investigate which month in the song changed as it was handed down in the oral tradition.